This classic designer 18k white gold three stone engagement ring displays three beautiful diamonds in elegant trellis settings. The sidestones go up in size as the size of the center stone increases. The sidestones all have a color of G-H and a clarity of VS. 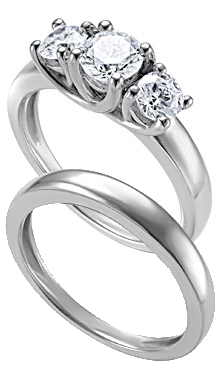 The classic plain wedding band is a nice match to this elegant ring.